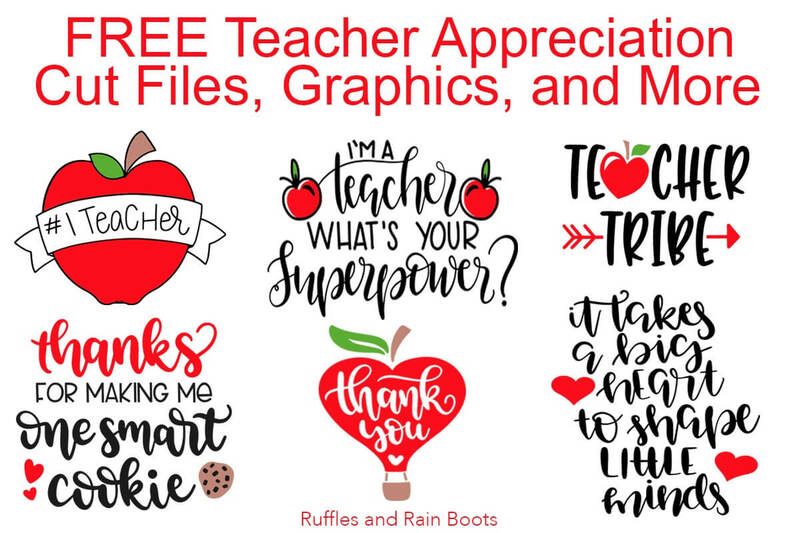 These free teacher SVG files will take teacher appreciation week and back to school gifts to a whole new level. Get your free SVGs and let’s get crafting! 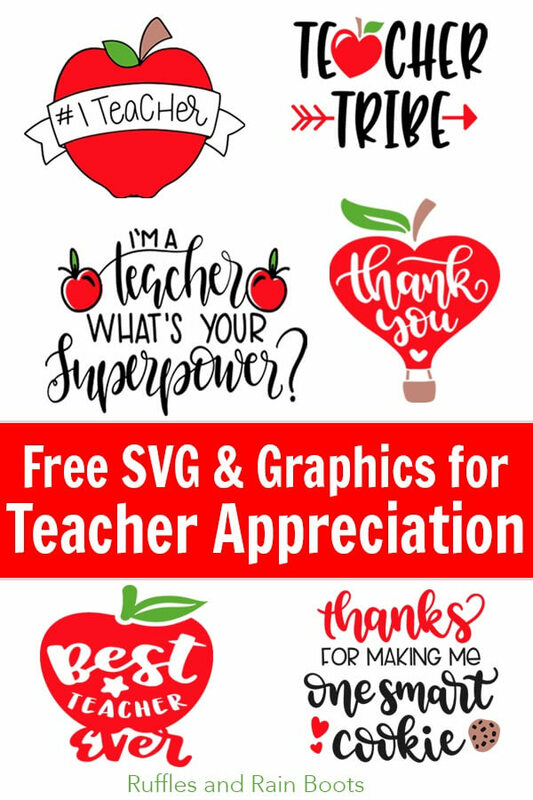 Free Teacher SVG Files and More! Teacher appreciation week is pretty amazing. As the parent of a Kindergartener, we were able to show quite a bit of love to my daughter’s teacher. Because she rotates (my daughter keeps the same teacher for K and 1st grade), we were brainstorming for teacher appreciation gift ideas we could do this year. I decided to round up some of the cleanest, cutest, and free teacher SVG files, cut files, graphics and more for you. Sign Up to Get Notified of New Free SVG Collections! If you’d like to be kept up to date on all of our free SVG collections, subscribe to our once-weekly email. You’ll be notified of all the crafty and creative things we do around here at Ruffles and Rain Boots. Sign up for the weekly email to get notifications on free SVG, cut files, graphics, fonts, and more! Apples are synonymous with teaching and the little ones LOVE picking out the cutest SVGs for teachers. How great would it be if a teacher wore this on field day? There is an astounding number of teachers who fit this description. A not-so-traditional free apple SVG file for the not-so-traditional teacher. I love clean designs and this free teacher SVG file is no exception. If you’re giving a gift card, this gift card holder SVG is Adorable with a capital A! These files all make great gifts because they’re almost all the way done! See below for a few great gift ideas for teacher appreciation week. You can put these in your cutting machine (Cricut, Silhouette, etc.) or use them with Microsoft Word, PowerPoint, or the free online editor, PicMonkey. Do you know a teacher who lives on coffee?! Gotcha covered. It certainly takes a lovely soul to be able to teach. This free book treat bag SVG is all the cuteness and none of hte hassle. Love it! If you’re looking for a few more ideas on teacher appreciation gift ideas, check out these teacher projects made with a cutting machine.